Madaket Stables' Monette will look to go one better when she makes her second North American start in Sunday's $100,000 Stewart Manor, a six-furlong turf sprint for juvenile fillies, at Aqueduct Racetrack. The dark bay daughter of Cockney Rebel launched her career in France, making six starts for trainer Bruno de Montzey, winning twice and finishing second another three times while competing exclusively in turf sprints. Purchased privately following her July 31 victory in the Criterium de Bequet at La Teste de Buch, Monette was transferred to the care of trainer Graham Motion and made her North American debut with a flourish, rallying from last of 11 to finish second, by a head to Lonely Road, in the Grade 3 Matron on October 8 at Belmont Park. With Jose Ortiz up for the Matron, Monette broke slowly from the outside post and trailed the field by 8 1/2 lengths at first call before launching a strong rally to reel in all but the winner. Motion is pleased with how Monette has trained into her Aqueduct debut from their home base at Fair Hill Training Center in Maryland. “I've been happy with her. She's been very straightforward,” said Motion. With Ortiz confirmed to pilot Regal Glory in the Stewart Manor, his brother, Irad Ortiz, Jr., will pick up the mount. Trained by Chad Brown, Regal Glory is a well-bred daughter of Animal Kingdom out of the multiple graded stakes winner Mary's Follies. Her half-brother, Night Prowler, is also a multiple graded stakes winner having captured the Grade 3 Dania Beach and Grade 3 Transylvania under Brown's care in 2015. 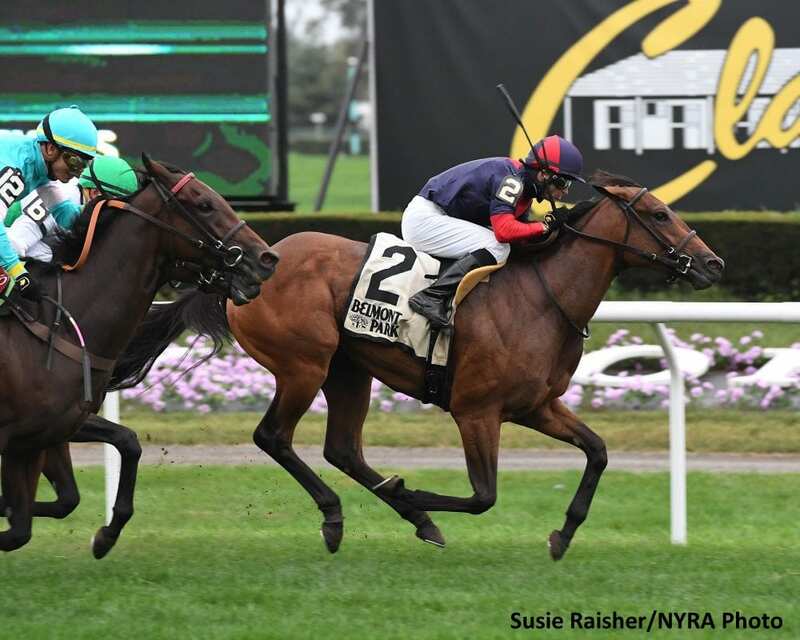 The Paul Pompa, Jr. homebred demonstrated a mark of class on debut when sprinting to a 5 ½-length score over the Belmont green that garnered a field-best 75 Beyer Speed Figure. The talented chestnut has breezed three times out of her maiden win including a sharp October 30 effort over the Belmont main when working four furlongs in 47.82 seconds. A stacked field for the Stewart Manor includes the graded stakes placed Guacamole and the stakes-placed duo of Dragic and Jaded Lady. Guacamole, trained by Todd Pletcher for Repole Stable, was promoted on her debut at Saratoga Race Course after finishing second, by a nose, to Super Simple in an off-the-turf maiden allowance. The dark bay daughter of Flat Out returned to finish third in the Grade 2 Adirondack before taking a dip in form with a pair of off-the-board efforts in the Grade 1 Spinaway and Grade 3 Matron. Luis Saez retains the mount. Steven M. Bell's Dragic graduated at first asking on the Keeneland main in April before a lengthy freshening that saw her return at Del Mar to finish fourth in the Grade 2 Sorrento. The well-traveled daughter of Broken Vow, trained by Wes Ward, arrives at the Stewart Manor from back-to-back thirds in the Kentucky Downs Juvenile and Futurity at Belmont. Hall of Famer John Velazquez will ride. Jeremiah Englehart will saddle Jaded Lady for Sequel Racing. The Shanghai Bobby filly was a half-length winner second time out while making her turf debut on August 1 at Saratoga. Following a third in the Lady Finger after a troubled trip over the Finger Lakes main, Jaded Lady returned to the turf last out when a non-threatening seventh in the Matron. Manny Franco has the call. Brooke Marie, Introduced, Music of Life (AE), Red Hot Dame, Shak's Hidden Gem and Tradeable complete the field. The Stewart Manor will go as the eighth race on Sunday's nine-race card which also includes the $125,000 NYSS Staten Island. First post time is 12:20 p.m. This entry was posted in Racing and tagged aqueduct, brad weisbord, bruno de montzey, Chad Brown, cockney rebel, France, Graham Motion, Irad Ortiz, madaket stables, Matron Stakes, monette, regal glory, stewart manor by NYRA Press Office. Bookmark the permalink.